TR6 Removing Left Rear brake line... help! 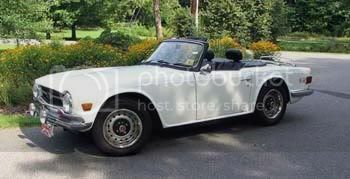 TR6 » Removing Left Rear brake line... help! Thread: Removing Left Rear brake line... help! Removing Left Rear brake line... help! I am in the process of removing the brake lines on my '73 TR6 and of course there's always one that gives you trouble. Specifically I can't remove the Left Rear brake line. I have the hose disconnected from the caliper but I'm unable to remove it from the three-way connector. There's little room to get a wrench on the hose fitting and no room to turn the wrench. The hose is on TIGHT! Any suggestions for getting the Left Rear brake hose off? Re: Removing Left Rear brake line... help! I remember swearing in that wheel well but if I remember right the 3 way was easier to get to from under the car. Elliot,That''s it, remove the 3 way 7/16 bolt and the pipes from it. Be sure to use a line wrench, don't want to round those lines and have to buy new ones. Be very careful with the line going from the flex hose to the wheel cylinder. That right angle bend at the wheel cylinder will turn and break if you look at it side ways. I have a friend who does not frequent the forums. He just changed his brake lines and yes the left rear was a bad one. What he used was a crows foot wrench with an extension and ratchet and then made up a piece of wood to use as a wedge to hold the 3 way in place as it tends to want to twist with the fitting. 1959 TR3A A work in progress. Seems awful tight to get a ratchet in that space. This afternoon I hope to get back out to the car and give it a go once again... will let you know how things go. With a crows foot and an extension you do not need to get to close with the ratchet . So you can use a long enough extension to be able to use a ratchet. OK, the job is done and it was a royal PITA. I ended up removing the 3-way connector with some wrenches, then removing the rubber brake line that was connected to it. I replaced all the rubber lines with four new Goodridge braided brake lines. I only hope I'll be able to tell the difference after all this work! Thanks for everyones help... it's appreciated.